Water cooled grindstones have been around as a means of sharpening tools for hundreds, if not thousands, of years. Powered wheels removed the need for an apprentice to provide the motive power and the introduction of jig based systems in the 1970s meant that obtaining an accurate and repeatable grind no longer required the skill of an experienced craftsman. and repairing damaged tools alongside a Tormek T3 system, which I use for general sharpening and honing. Any comparisons made during this test are with this system. In addition the following accessories were provided for the test: WG250/A Gouge Jig, WG250/B Carving Tool Jig, WG250/E Scissor jig, WG250/G and WG250/H Small and Long Knife Jigs, WG250/I Toolrest, WG250/K Diamond Truing Tool, WG250/D Plane Camber Jig for sharpening plane blades to a convex shape and the WG250/F Side Jig which enables sharpening to be carried out against the side of the stone. Also available but not tested is the WG250/O Extension Arm which mounts on the support arm and allows the user to utilise the honing wheel without removing and refitting the support arm. Unlike the Tormek machines there is no jig specifically for skew chisels, but I found that these can be sharpened quite accurately using only the WG250/I Toolrest, moreover the support arm of the WG250 is the same diameter as that on the Tormek and thus compatible with Tormek jigs and vice versa. Most machines of this type are single speed, but the WG250 has speeds variable from 90-150rpm which not only increases its versatility but allows the user to compensate for the decrease in diameter of the stone as it wears. Torque adjustment is also provided which, by altering the pressure on the friction drive, allows more torque for heavy grinding. As with other machines of this type, the support arm can be mounted in two positions depending upon whether the sharpening process to be carried out is best performed with the wheel revolving towards or away from the tool. Honing on the leather wheel is always carried out with the wheel revolving away from the tool. The support arm is fitted with a fine adjuster to enable accurate alignment of the bevel of the tool against the stone and is locked in place by two lock knobs. Setup and adjustment is facilitated by means of the angle finder and angle setting gauge, as explained in the instruction manual supplied with the machine, although I found that setup was easy enough to carry out manually in most cases. 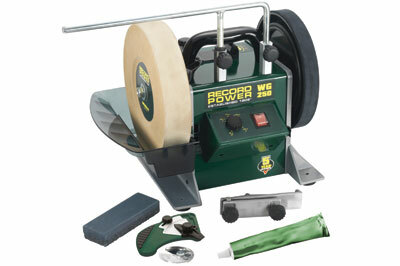 The WG250/R Dual Surface Stone Grader dresses the wheel for coarse or fine sharpening. Occasional use to sharpen the grit of the stone helps maintain the speed and quality of the grind. Truing of the stone can be undertaken with this tool but is better achieved with the optional WG250/K Diamond Truing Tool. I began the test by sharpening and honing the blades of my Lie Nielsen low angle block plane and Clifton No.5 jack plane using the Straight Edge Jig. This was accomplished very quickly and resulted in both cases in an edge capable of producing translucent shavings, as good as the edge produced by hand honing on a diamond stone. The clamp mechanism of the jig is large enough to allow the Clifton plane iron to be fitted without the need to remove the split cap iron which is useful if you are in the middle of a job and don't want to waste a lot of time dismantling, reassembling and re-setting your plane. Having tested the basic sharpening ability I wanted to see how well the machine would cope with a blade in need of a little more work. I retrieved the battered old Stanley chisel that I use for rough DIY work and which I would normally repair on the dry grinder. This was suffering from a number of 'dings' in the edge from contact with screws and nails and the edge was anything but square. I timed this operation and was able to achieve a perfect edge in just over three minutes. This was quite slow compared to the dry grinder, but resulted in a much finer edge. I then tried out the WG250/D Plane Camber Jig which although a little complicated to set up at first, produced a nice cambered edge on the iron from the No.5 jack plane. The jig is easily adjustable to increase or decrease the degree of curvature of the edge. Next I tried out the Gouge Jig with bowl and spindle gouges in a variety of grinds. This jig, which is used with the wheel turning towards the tool, consists of a base which is clamped to the support arm and the body of the jig which has a shaft with a pointed end that rests upon a recess in the base and an elbow joint to set the length and shape of the gouge wings. The angle of the bevel is set by adjusting the position of the support arm. I found I was able to accurately replicate all of my existng gouge grinds from straight across to long fingernail. The jig was easy to use and straightforward to adjust. I did not try to convert gouges from one grind to another but this could easily be achieved by, for example to convert from a straight grind to fingernail, first grinding the wings back with the gouge held flute down against the wheel and then using the jig to achieve the correct bevel and refine the shape. The WG250/B Carving Tool Jig rests against the support arm and the bevel angle is adjusted by moving the position of the support arm. This jig, although designed for carving tools, is useful for other small or short tools and I found it could also be used for spindle roughing gouges up to about 25mm in section. The Toolrest Jig is similar in principle to the toolrest of a dry grinder and can be used to support most tools that cannot be sharpened using one of the other jigs or where the user prefers to operate freehand. I used it to sharpen my turning and cabinet scrapers and also my skew chisels. The jig clamps firmly to the support arm with a locking knob and can be adjusted to achieve a wide range of angles. In use it is robust with little or no flexing of the support arm. It can also be used with the Side Jig to sharpen against the side of the stone wheel which is very useful for drill bits and other tools that are best honed against a flat surface. The knife and scissor jigs, whilst perhaps of less interest to us as woodworkers are useful accessories to add to the grinder as they enable a much more accurate edge to be put on kitchen knives, etc. I tested these and found that they performed their designed functions well, the clamping mechanisms being robust and easy to use. I also found that with the small knife jig I was able to restore an edge to worn utility knife blades, too. A useful feature if you find yourself with a blunt blade and no spares to hand. Overall I liked this machine. The quality and robustness of the jigs and components compares favourably with those of my Tormek T3 and it is large and heavy and does not move on the bench in use, which can be a problem with lighter machines. The quality of the edges I was able to produce with it was as good as those I have been able to produce using any other sharpening method either by hand or machine. The large water trough catches most of the splashes but, especially at higher speeds, there is some spillage and I would recommend using the machine on a water resistant surface. My only real gripe was that with one of its mounting points hidden behind the stone the water trough is a bit fiddly to install. The range of jigs is extensive, including some, such as the Plane Camber Jig and Side Jig that are not available from other manufacturers, although it lacks a dedicated skew chisel jig or an attachment for planer blades. The compatibility of the jigs with those of the Tormek system, however, renders this minor problem somewhat superfluous. Priced competitively - at only slightly more than the Tormek T3 and considerably less than its big brother the T7 - this would make an ideal machine for anyone looking for a first wet grinding system or seeking to upgrade from a smaller machine especially given that the jig systems are interchangeable. Size: 320mm high x 470mm wide x 285mm dia.